In 2010, 0.8% of the world’s population belonged to religious groups not classified elsewhere in this report. 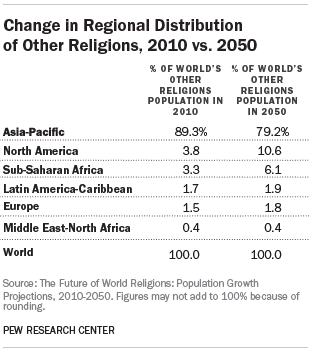 By 2050, adherents of other religions are expected to decline slightly as a share of the world’s population (to 0.7%). This “other religions” category includes followers of religions that are not specifically measured in surveys and censuses in most countries: the Baha’i faith, Taoism, Jainism, Shintoism, Sikhism, Tenrikyo, Wicca, Zoroastrianism and many others. 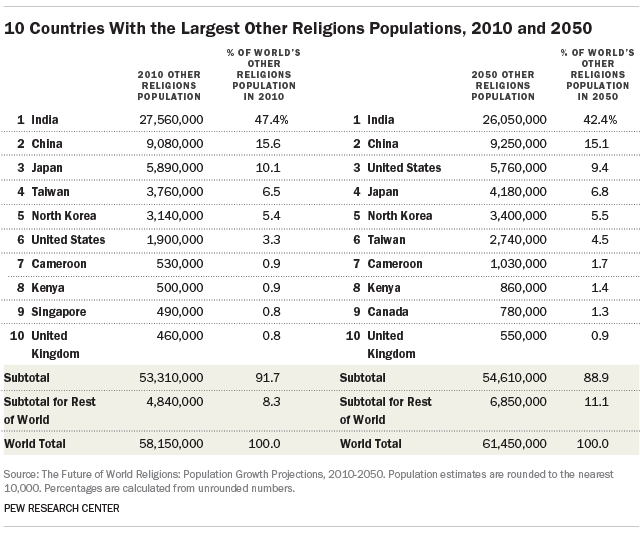 Because of the scarcity of census and survey data, the Pew Research Center has not estimated the size of individual religions within this category, though some estimates from other sources are provided in the sidebar below. As a whole, this group is expected to grow from about 58 million in 2010 to more than 61 million in 2050. The “other religions” category is diverse and comprises all groups not classified elsewhere. It includes followers of religions that are not specifically measured in most censuses and surveys, including (but not limited to) the faiths listed below. Recent estimates of population sizes for these groups generally come from sources other than censuses and nationally representative surveys. The Baha’i faith began in Persia (now Iran) in the 19th century. Baha’is are widely dispersed across many countries, with significant populations in India, the United States, Kenya and elsewhere. The Baha’i International Community reported more than 5 million adherents in 2010. Jainism originated in India and dates back to at least the 6th century B.C.E. Today, the vast majority of Jains live in India, though significant numbers also are found among Indian immigrant communities in Kenya, the United States, Canada and the United Kingdom. The 2001 Indian census enumerated more than 4 million Jains in India, but some Jains have contended that number is a substantial undercount. According to estimates by the World Religion Database, there are about 250,000 Jains outside India. Shintoism is a Japanese faith that has been part of religious life in Japan for many centuries. Although Shinto rituals are widely practiced in Japan, only a minority of the Japanese population identifies with Shintoism in surveys. The World Religion Database estimates there are almost 3 million Shintoists worldwide, with the vast majority concentrated in Japan. Taoism (also known as Daoism) traditionally is said to have been founded in the 6th century B.C.E. by Chinese philosopher Lao Tzu. Adherents live predominantly in China and Taiwan. The World Religion Database estimates there are about 8.7 million Taoists. Tenrikyo was founded in the 19th century by Nakayama Miki in Japan. The faith is one of many new Japanese religions; others include Shinreikyo, Mahakari, Omoto and PL Kyodan. Reliable estimates of the number of followers of Tenrikyo and other new Japanese religions are not available. Wicca is a Pagan or neo-Pagan religion that gained popularity in the 20th century. It is practiced mostly in the United Kingdom and the United States. Reliable estimates of the number of Wiccans around the world are not available. Zoroastrianism traditionally is said to have been founded by Zarathustra in Persia (now Iran) sometime before the 6th century B.C.E. Adherents live mainly in India and Iran. The World Religion Database estimates there are about 200,000 Zoroastrians worldwide. Other faiths in this category include Cao Dai, I-Kuan Tao, Mandaeism, the Rastafari movement, the Rtana movement, Scientology and Yazidism, to list just a few. 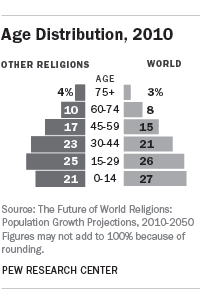 The “other religions” population is expected to grow at a slower rate than the general population in the decades ahead. In 2010-2015, for example, the growth rate for members of other religions is 0.5%, compared with 1.1% for the world’s population overall. 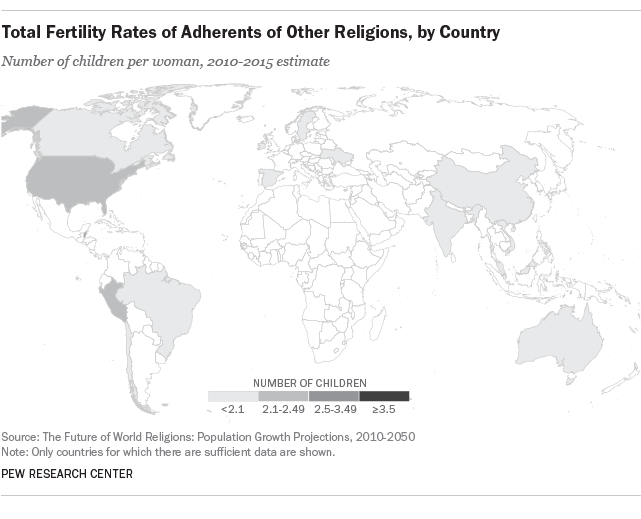 By 2040-2045, adherents of other religions are projected to start declining in size (negative growth). Members of other religions are expected to remain heavily concentrated in the Asia-Pacific region, where 89% resided in 2010 and 79% are projected to reside in 2050. North America’s share of the world’s “other religions” population is expected to grow from nearly 4% in 2010 to 11% in 2050. The share of the “other religions” population living in sub-Saharan Africa also is expected to increase (from 3% to 6%). In the coming decades, the number of adherents of other religions is expected to decrease in the Asia-Pacific region, while the population belonging to other religions in each other region of the world is projected to grow. In 2010, nearly 52 million people in the Asia-Pacific region belonged to other religions. By 2050, this number is expected to decrease to 49 million. As the absolute number of people adhering to other religions drops in the region, the share of the Asia-Pacific population belonging to other religions also will drop. Meanwhile, the “other religions” population is projected to triple in size in North America, from 2.2 million (0.6% of the population) in 2010 to 6.6 million (1.5% of the population) in 2050, due largely to switching into other religions (such as Wicca and pagan religions) in the United States. In sub-Saharan Africa, the number of adherents of other religions is expected to nearly double, rising to nearly 4 million people by 2050. 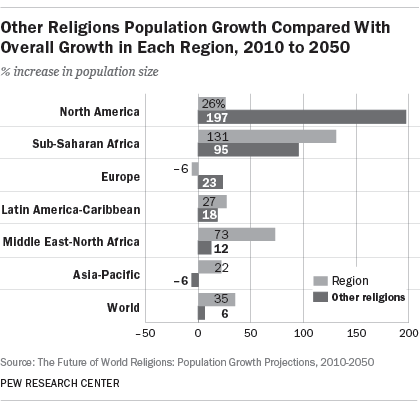 Between 2010 and 2050, the most rapid growth of the “other religions” population, in percentage terms, is projected to occur in North America (197%), which is more than seven times the expected increase in the region’s overall population (26%). In Europe, the “other religions” population is expected to increase 23% between 2010 and 2050, even though Europe’s population as a whole will decrease in size (minus 6% growth). Meanwhile, it is projected that the “other religions” population will decrease (minus 6% growth) in the Asia-Pacific region, while the region as a whole will grow 22% between 2010 and 2050. Six of the 10 countries with the largest “other religions” populations are expected to decline as a share of the world’s population between 2010 and 2050. China is expected to have 14% of the world’s population in 2050, a drop from nearly 20% in 2010. Japan’s population also is anticipated to make up a smaller share of the world’s population in 2050 than in 2010 (1.2% vs. 1.8%). India is among the exceptions: The share of the world population living in India is projected to rise slightly between 2010 and 2050, remaining around 18%. But the percentage of India’s population that is in the “other religions” category is expected to decline from 2.3% in 2010 to 1.5% in 2050. The shares of the populations in Japan, Taiwan and Singapore belonging to other religions also are projected to decline in the coming decades. Nearly half (47%) of the world’s adherents of other religions, mostly Sikhs and Jains, lived in India in 2010. Outside of India, the largest shares of people belonging to faiths in the “other religions” category were in China (16%), Japan (10%), Taiwan (7%), North Korea (5%) and the United States (3%). With 26 million people (or about 42% of the world’s “other religions” population), India will remain home to the largest number of adherents of other religions in 2050. 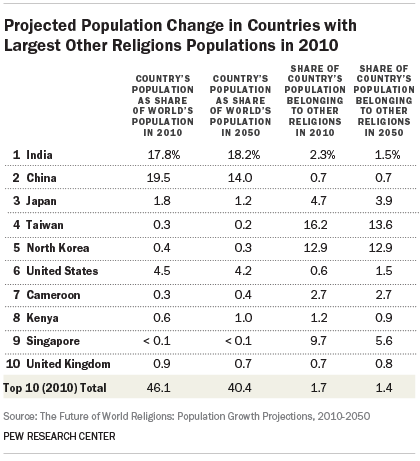 Significant populations belonging to other religions are expected to remain in Asian countries in 2050, including China (9.3 million), Japan (4.2 million), North Korea (3.4 million) and Taiwan (2.7 million). 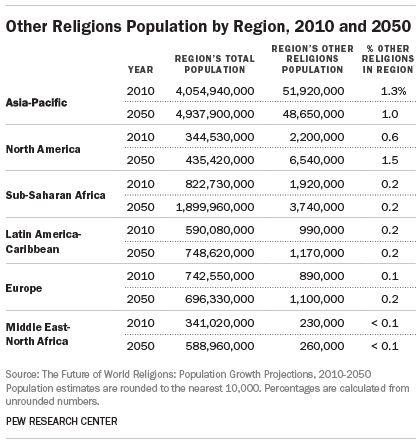 The United States is projected to hold the third-largest population of people belonging to other religions in 2050 (5.8 million), rising from the sixth-largest in 2010. About one-in-ten of the world’s adherents of other religions (9%) will live in the United States in 2050, according to the projections, and neighboring Canada is expected to join the list of countries with the 10 largest “other religions” populations come 2050. With a Total Fertility Rate (TFR) of 1.7 children per woman, adherents of other religions have, on average, fewer children than the world population overall (2.5) between 2010 and 2015. This means that global fertility among members of other religions is below the replacement level of 2.1 children per woman (the number considered necessary to maintain a stable population, all else being equal). Countries where “other religions” populations have fertility rates above replacement level in the 2010-2015 period include Belize (3.0) and Peru (2.4). Fertility for this population is at replacement level in Canada (2.1) and the U.S. (2.1). In the remaining countries with reliable data, fertility rates for those in the “other religions” category are below replacement level. Religious switching was not modeled in most countries with a large number of people in the “other religions” category. Consequently, religious switching does not significantly influence global population projections for this group. Data are available on switching in and out of other religions in the United States, however. In fact, religious switching explains almost all of the expected growth in the number of adherents of other religions in the U.S.54 Specifically, when religious switching is taken into account, about 1.5% of the U.S. population is expected to belong to other religions in 2050. Without religious switching, members of other religions would make up only 0.6% of the U.S. population in 2050, the same share belonging to other religions in the U.S. in 2010 (0.6%). For most regions, migration is not expected to have a substantial impact on the growth of the “other religions” population. Europe is expected to experience modest growth in this category due to migration from Asia and the Pacific and sub-Saharan Africa.